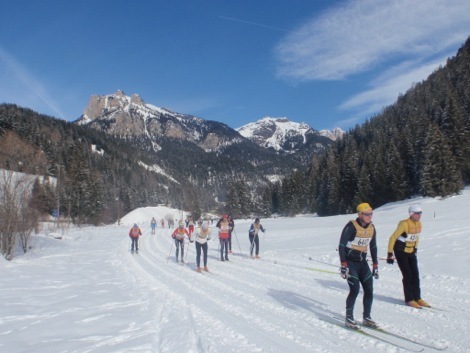 Snow and sun for the 40th Marcialonga ! 40 years : age of discretion ? When in 1982, 31 years ago, I run for the first time the Marcialonga, there were about 3 or 4 thousand people, essentially Italians but with a big number of French’s : several hundreds. I didn’t remember to have seen Scandinavians. The race started in Moena, climbed up to Canazei, came down to Molina and finished in Cavalese : the same as now. We were skiing classic style, because nobody known other style and every village we crossed gave us a fantastic feast. In case of lack of snow, militaries brought just enough snow under your skis to do the race : the same at now, except militaries are now … snow canons. But how many change in thirty years. Twice more competitors, at first Norwegians and Swedish : more that Italians ! Only … 32 French. It’s difficult to book an accommodation and more difficult to get a bib … if you travel alone and are not Scandinavian with tour operators or Italian. 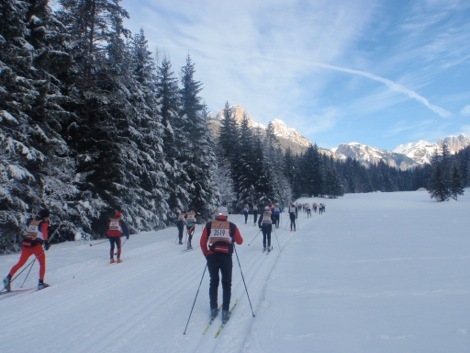 In 2013, to celebrate their 40 years, Marcialonga made an agreement with weather forecast: a fresh and fast enough snow, sunny morning not to cold and lovely tracks all during the race. Even to climb up from Molina to Cavalese : a delight! We started exactly on time : I remember in 1982 we leave Moena with 15 minutes to spare (in advance ?). The best skiers wins : Aukland brothers, Rezac, Ahrlin and Dammen in less than 3 hours for 71.6 km ; Serena Bonner, Laila Kveli, Tatiana Jambaeva for the women in less than 3 hours and half. 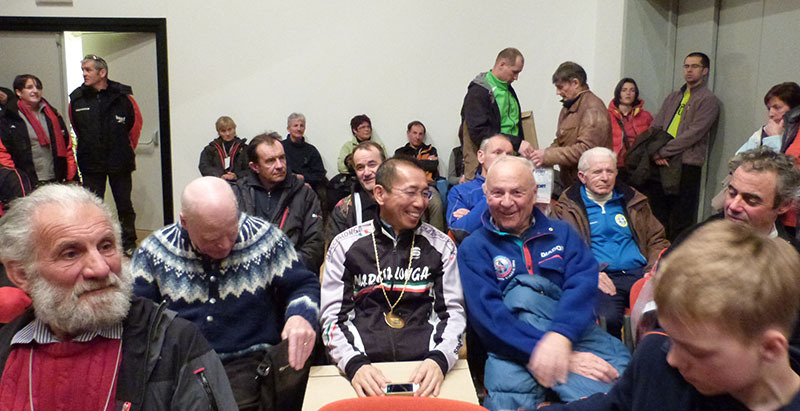 This Marcialonga look like championship Norway/Sweden : 30 competitors from those two countries in the 50 first ! Luckily, Rezac was here : this fantastic Czech skier who join the Aukland brothers ski-team. “I won because I’m the best in the world in double push“ said Jorgen Aukland on the finish line. And that’s right. “To have a luck to be in the 100 first competitors”, Daniel Sandoz told me the Saturday before the race, “you have to do the race without wax : only glide. Ski makers propose now ski specially for double push ! What a pity but it’s so.” Daniel Sandoz finished 67th in 3h 24min – first master 50 years old ! Without wax, of course. No traffic jam with the “Ideal Start” although the trail is narrow, very good organization at the finish line : even pasta al dente for 6000 skiers ! 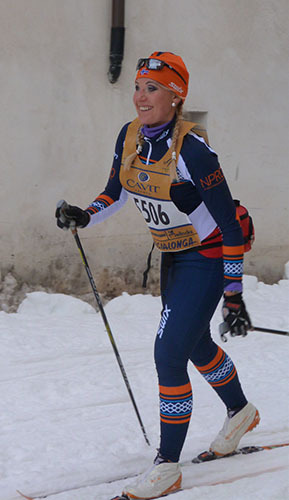 Congratulation to this years Marcialonga : A lovely race … for people who can register! This year, for skiers non Scandinavians or Italians, the registrations where closed right after it opened. A problem criticized by skiers coming from every country. IAWLS gave 30 memberskiers to pre-register: thanks’ to Marcialonga and to IAWLS for that but it’s not the good solution for next years. Marcialonga said us that for next year they give the first option to book the start-numbers to the hotels of the valleys. It is better than nothing but I think that it’s not the good solution. We will speak about that during our next GA in Engadin…..